In OpenRoads Technology (SS3 and beyond) standards are managed through the use of *.dgnlibs. 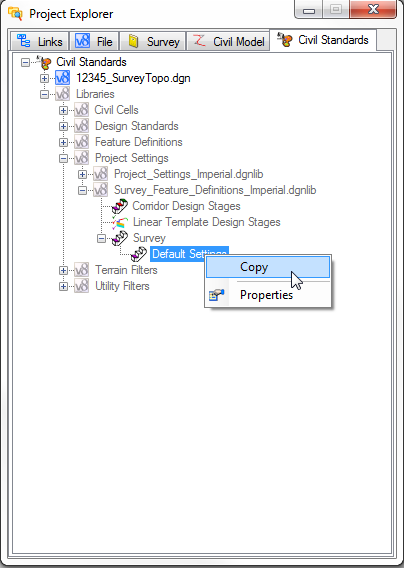 This includes settings for survey items such as Link Codes, Import Formats, Text Size, and Terrain Model creation. However project specific Survey Settings that deviate from established standards can be made. For example, when you import your RAW data you need the Link Code Position to be After Point Feature Definition vs. Before Point Feature Definition. The workflow for accomplishing that task is to copy the standard settings into the CAD file you will be processing data in. 1. From the Project Explorer dialog select the Civil Standards tab. 3. Expand the Survey section and the Default Settings will be shown. 4. Right Click the Default Settings and Copy the settings to your clipboard. 5. Expand the Drawing file to Project Settings > Survey and Paste and Rename the Settings. 6. Right Click on the new settings and select Properties. The Element Information dialog will appear. 7. Expand the section Linking Codes and Change the Link Code Position to either Before or After Point Feature Definition. 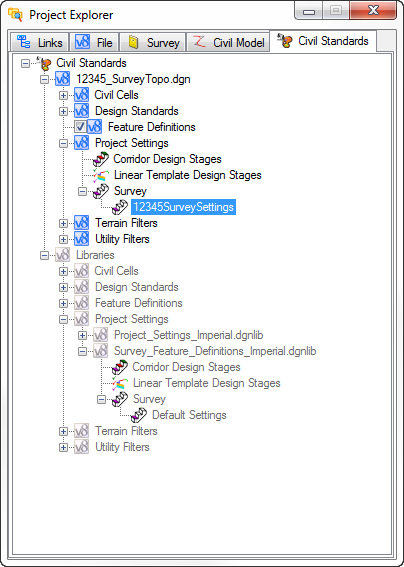 Note: These Survey settings are now stored in the DGN file and will stay with the survey data. The settings will be saved automatically so there is no need to Save Settings on exit. We will be writing more OpenRoads tips moving forward but we will still have InRoads tips as they come up. If you want to learn more about OpenRoads read our previous blogs.